Epifania Torres (nee Ojeda), 95, passed away Thursday, June 7, 2018 at her home in Lorain. 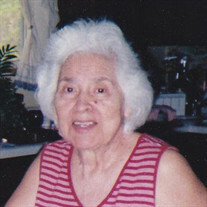 Born April 7, 1923 to Jesus and Rumalda (nee Armenta) Ojeda, she lived in Dallas, Texas until moving to Lorain in 1949. Epifania was a loving wife, mother and homemaker. She enjoyed the flowers and telenovelas. In her youth she worked as a seamstress on military uniforms and also as a migrant farm worker. Surviving is her son, Jesus Torres of Lorain; daughter, Norma Garcia of Lorain; several generations of grandchildren and great-grandchildren, as well as many nieces and nephews. She was preceded in death by her husband of 54 years, Juan Isaias Torres Ramirez; parents; brothers, Ventura 'Joe' Ojeda and Raymundo Ojeda; sister, Luz Perez, many nieces and nephews and a grandson in infancy. The family will receive friends on Wednesday from 10:00 am - 11:00am in the Dovin Funeral and Cremation Specialists, 2701 Elyria Avenue, Lorain, Ohio. Burial will follow in Ridge Hill Memorial Park, Amherst Township.